Hiya! As promised yesterday, here's a quick look at the mismatched right hand I wore with my grey vintage flowers. I never photograph my right hand because it never looks quite as good, plus I find it harder to pose and etc since I'm not used to it. However, this combo ended up so pretty I had to snap a few pics between World Cup games! 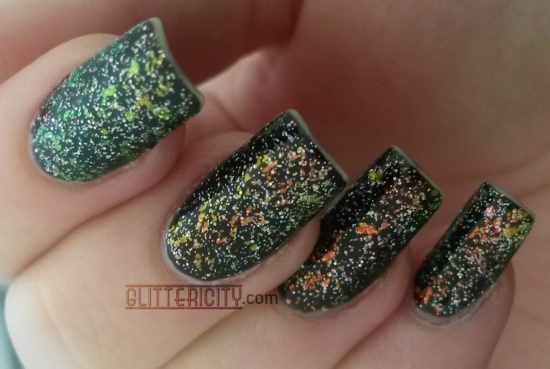 Base is a plain black creme, Soulstice Spa Gotham, and then I layered BYS Glitter Crystal (silver scattered holo--think CG Fairy Dust but with much bigger particles) and Nubar 2010 (colour-shifting flakies) on top. It sparkled so nicely in the light! Here's one outdoors, out of focus to really show off the rainbow explosion. I wish the flakies had shown up more, but I was in a rush taking photos and didn't have much sunlight to work with. The warm orange/yellow is mostly caused by those, and then you can see the shift best in the first photo.